Spring has arrived in New York, and it’s peak season for urban wandering. This means we can finally escape our warm apartment sanctuaries and go forth once more to explore our city’s streets and public spaces. Whether or not the weather has yet turned in a favorable direction for your city, we have a challenge for everyone reading this: the next time you go for a walk, think about your city, neighborhood, or favorite space in the context of the Power of 10. So, what is the Power of 10? Places thrive when there are at least 10 things to do, arranged in such a way as to create social linkages. Scaling this up, a specific destination or neighborhood needs at least 10 places, that offer people a reason to visit and spend time there. One more level up, a city needs at least 10 major destinations, creating a powerful network of a thousand things to do. One of our most important conclusions from our studies of public space, this principle is based on the idea of triangulation, drawn from from PPS mentor William H. Whyte’s The Social Life of Small Urban Spaces. Whyte wrote, “Triangulation is the process by which some external stimulus provides a linkage between people and prompts strangers to talk to other strangers as if they knew each other.” We’ve taken this concept and applied it at several different scales, creating the Power of 10. It’s important to note that this is a flexible principle, so if your city has 9 or 11 destinations, don’t fret. We use 10 to get people thinking big, but many cities are successful with fewer destinations, and destinations can be great with fewer places. 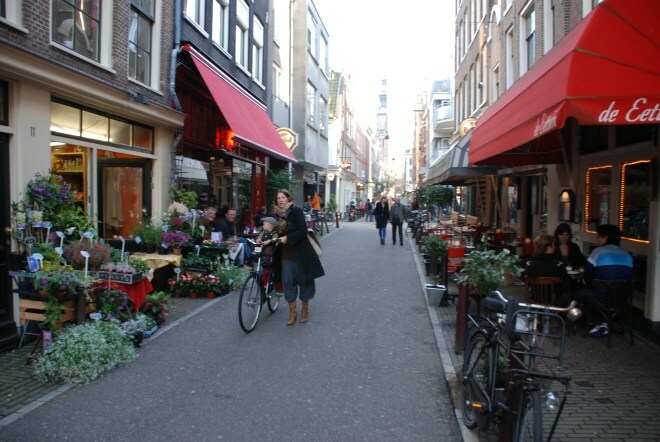 What counts as a “place” is also flexible: in some neighborhoods it will be a park or plaza, in others it might be a great shopping street or a popular sidewalk café. As for things to do? The sky's the limit! Any activity counts, as long as it brings people into the space; it can be as active as a yoga class and as passive as a great spot for people-watching. When you head out on a walk in your neighborhood this weekend, try the following challenge -- this is similar to what the PPS team does when we arrive in a new city. 1. Pick the area you want to study - it can be a single park, a neighborhood, or, for our ambitious readers, the entire city. 2. Bring a notebook or take notes on a smartphone. Write down as many places or things to do as you notice (playgrounds, cafes, shops, market, and so on). Be creative! Then, note whether these places are great or have room for improvement. 3. Once you return home, print out a map of your study area (you can save paper and do this digitally, but we recommend and prefer the tactile experience). Google Maps is great for this. 4. Grab three different colors of markers, pens, or sticky dots. We use green or blue for great places, red for unsuccessful ones, and yellow for those that have the opportunity to improve. 5. Time to rate your places. Based on your notes, mark all of the places you observed with the colored markers or dots. When you’ve finished, think about the results in the context of the Power of 10 -- do you have a network of great places? Were there more reds than greens or blues? Where is there room for improvement? 6. Take a picture of your map and send it to us - we’ll post some of them on social media to encourage others to take the Power of 10 challenge. To quote Holly Whyte, "you can see a lot by observing." 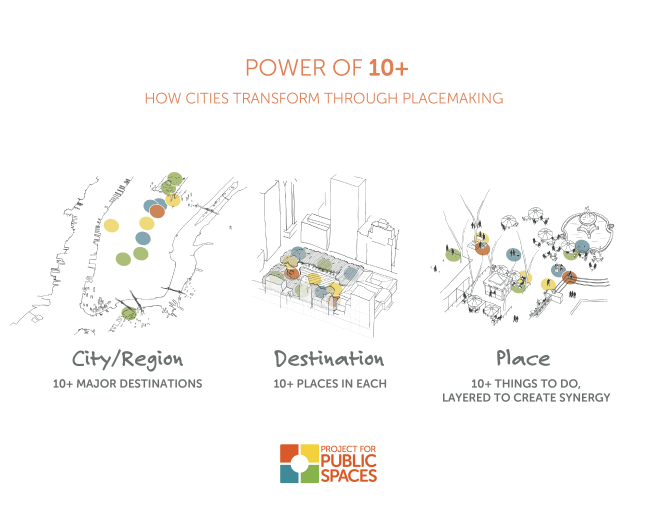 This exercise will give you a sense of how your city, neighborhood, or place can improve, and is the foundation of a city-wide placemaking campaign. Several members of our team recently worked with the Midtown Atlanta Alliance to study how the district can realize its potential during a period of increased development. The Power of 10 was at the core of this work, as key stakeholders in the district gathered around large maps to assess which places were great and which have room to improve. Left: The dots create a visual representation of a city’s public space network. RIght Top: The workshop encourages leaders to think differently about their city. RIght Bottom: PPSers Fred Kent and Elena Madison led the Atlanta workshops. You can see a lot of yellow dots on that map, which can be a good sign -- those places are perfect opportunities to run Lighter, Quicker, Cheaper experiments to figure out what will make them great. Interested in reading more about the Power of 10? We’ve written up its origin story here.